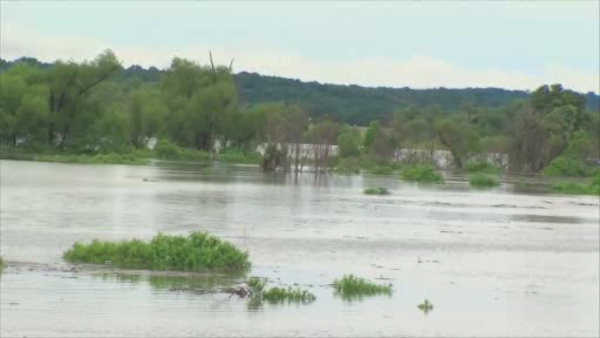 KILLEEN, Texas (WABC) -- The nine soldiers killed when floodwaters swept their Army truck at Fort Hood included two from the Tri-State area. Late Saturday night, Fort Hood officials released the names of eight of the nine soldiers who died. Among them were Staff Sgt. Miguel Angel Colonvazquez, 38, of Brooklyn and Pvt. Tysheena Lynette James, 21, of Jersey City. Only the wheels of an Army transport truck were visible after swift floodwaters washed the 2-ton vehicle from a low-water crossing on Thursday, killing the nine soldiers, Coryell County emergency medical services chief Jeff Mincy told the Killeen Daily Herald. Mincy said he arrived at the scene about 11:30 a.m. Thursday, and that firefighters had already pulled the three surviving soldiers from the rushing waters of usually dry Owl Creek. The other victims were identified as Spc. Christine Faith Armstrong, 27, of Twentynine Palms, California; Pfc. Brandon Austin Banner, 22, of Milton, Florida; Pfc. Zachery Nathaniel Fuller, 23, of Palmetto, Florida; Pvt. Isaac Lee Deleon, 19, of San Angelo, Texas; Pvt. Eddy Raelaurin Gates, 20, of Dunn, North Carolina; Cadet Mitchell Alexander Winey, 21, of Valparaiso, Indiana; and Spc. Yingming Sun of California, whose name was released Sunday. Army officials kept up their investigation of the training exercise that turned deadly.